Long before I was known as a food-obsessed diner, I had a passion for shopping. These days I spend more time shopping for restaurants than I do enhancing my wardrobe. Therefore, shopping for food and clothing in one fell swoop is a dream come true for a multi-tasker like me. 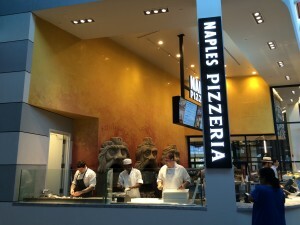 I hear positive buzz for the pizza at Naples Ristorante E Pizzeria E Bar, which has recently taken up residence in Bethesda’s Westfield Montgomery Mall. When I receive an invitation to check it out, I jump at the chance for a taste test. 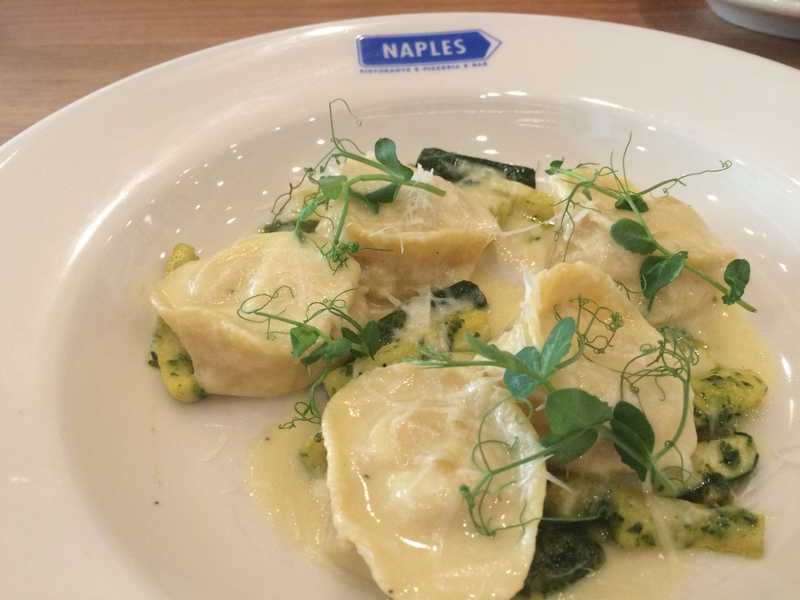 Naples is a spacious and attractively appointed restaurant located next to the newly renovated mall eatery. If you enter from the street side, you bypass the mall and are transported into a modern urban-like environment. 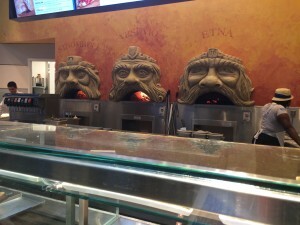 Conversely, you can enter through the mall and dine here without ever seeing the restaurant proper. If you’re not in a hurry to shop, take time for the full experience. 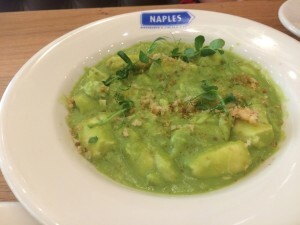 As a proud Italian-American chef with over 19 years in the restaurant industry, Executive Chef John Miele cooks with imported Italian ingredients complemented by fresh, local products. Chef Miele’s resume includes serving as Chef de Cuisine at Bryan Voltaggio’s Aggio and Range in Washington D.C. 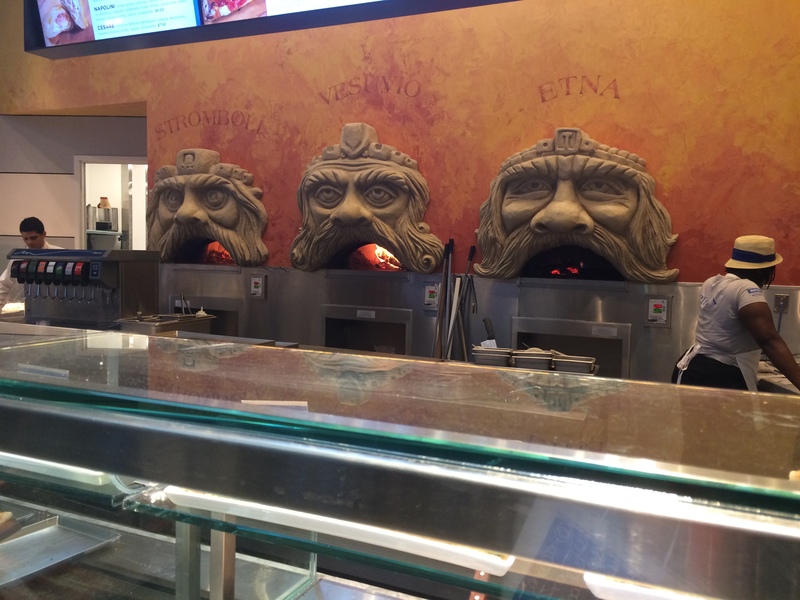 The restaurant boasts a trio of whimsical wood-fired pizza ovens sculpted with the “face” of one of Italy’s active volcanoes. 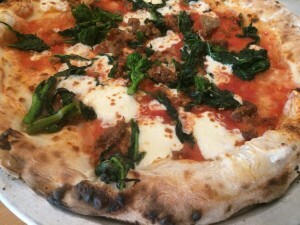 Those ovens are cranking out some fine Neapolitan pizza, including Barese Pizze with tomatoes, spicy sausage, broccoli rabe, and mozzarella. I take inventory of the piping hot pie. Slightly charred and chewy crust. Fresh and flavorful toppings. A little something extra to give it a kick. I’m sold. I admire the gnudi with ricotta dumplings, lump crab, spring peas, and lemon although it would benefit from a lighter saucing. Cappellacci with ricotta, corn, crema, almond pesto and pecorina cheese is a more enticing display, and I prefer the flavors of this dish in a side-by-side comparison. An enticing list of small plates includes Fiori Di Zucca -zucchini blossoms with salsa verde- along with arancini, calamari, and moscardini (baby octopus). The selection of salads at Naples are appealing accessories. 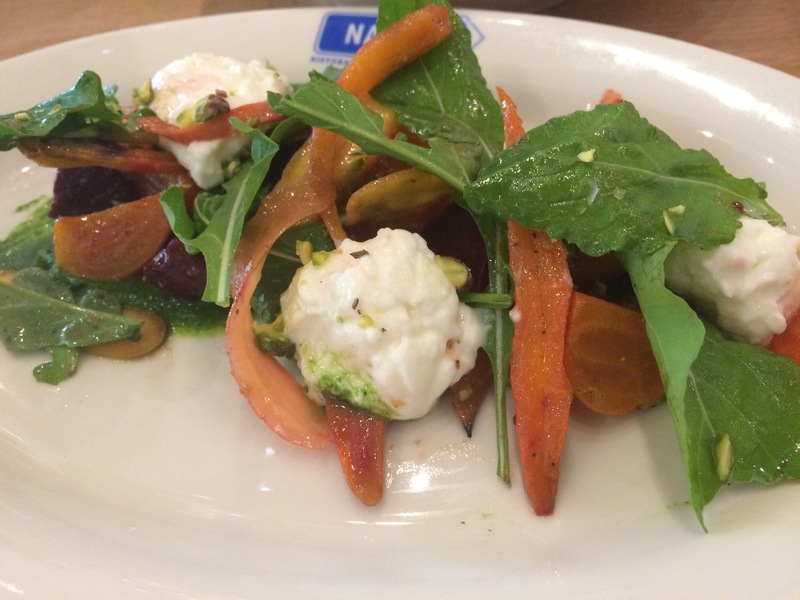 A seasonal special of roasted beets, carrots, arugula, stracciatella, and pistachio succeeds in lightening up my otherwise carb-heavy meal. Entrees at Naples range from eggplant to branzino to sirloin steak, but I’m personally fixated on the pizza and pasta. There’s also a comprehensive bar menu that leans toward the Italian, with a lively Aperol Spritz that catches my eye. As a shopper I am on a perpetual search for value, quality, and of course, good taste. 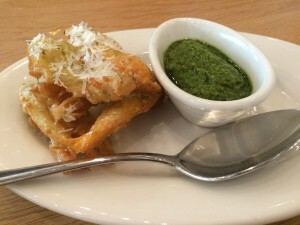 I find all three at Naples Ristorante E Pizzeria E Bar.